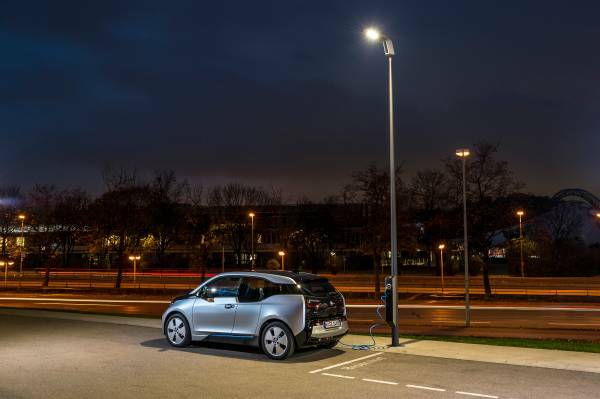 BMW has developed a new LED streetlight with integrated charging for electric vehicles (EVs), which it says is more energy-efficient than conventional street lighting and provides more effective illumination. The streetlights have a modular LED design, which can be adjusted for different road types. The system, known as Light & Charge, can be grafted directly on to existing local authority street lighting infrastructure, according to BMW. It includes an EV charging point with standard connector, and a control panel that allows all EV owners to use it, regardless of vehicle model. The streetlights have a modular LED design, which can be adjusted for different road types. Up to four LED modules can be used to provide lighting at night on main roads, while BMW claims one or two modules are sufficient to provide lighting on side streets and in residential areas. “Light & Charge is a simple and innovative solution which aims to integrate a charging station network into the urban landscape and this is essential if we want to see more electric vehicles on the road in our cities in the future,” said Frank Bachmann, managing director at MINI Plant Oxford, which is showcasing the technology at Low Carbon Oxford Week. Using “intelligent control electronics”, BMW says Light & Charge can adapt to its environment and provide energy savings by reducing light output late at night and when there is no passing traffic. LED technology is already widely in use in vehicle headlights, and the German manufacturer claims it enables more targeted light distribution and uniform illumination. This, in turn, leads to better road safety through reduced glare.